STRICTLY MISSION carries a variety of Arts & Crafts style stencils including the Dard Hunter Rose. Once you have selected the stencil you like best, select the set of colors appropriate to your decor. Then call us toll free at 866-647-7466 to place your order. You will find a wide assortment of appropriate paints at your local crafts store like Michaels. We ship every Tuesday and Friday via the US Mail. If the stencil you like is not in stock we will have it drop shipped directly from the manufacturer. Present quantities in stock are shown below next to each item. See Postage rates at the bottom of the page. Petite Stencils ~ Although these designs average only one to two inches in height, they can be used in a variety of ways. Table runners and other linens may first come to mind, but these designs could have originally been used for accenting frames, women's accessories and other smaller decorative items. You may also consider this size for panel work or to enhance crown molding. 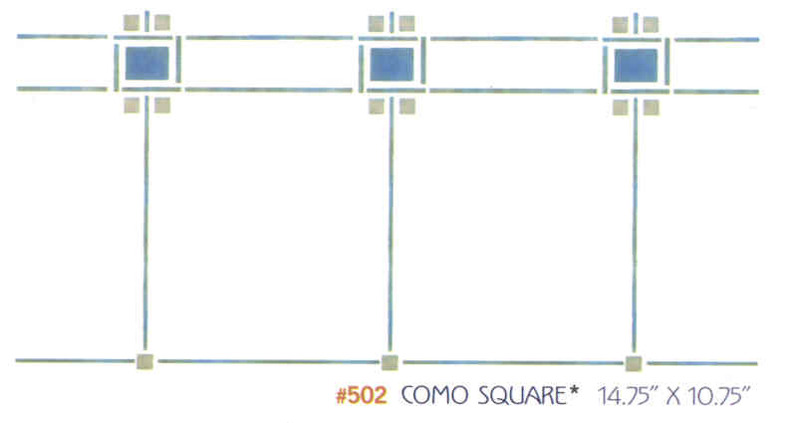 Small Stencils ~ This group of designs work well in areas where a smaller design is needed. Suitable for stenciling window curtains and larger table linens, these designs also work well for creating ceiling panels. Another excellent use for this size of stencil is to accent crown molding or run it continuously around a room with lower ceilings. Medium Stencils ~ The most versatile size of stencils, these designs work as well for eight-foot ceilings and larger curtains, as they do for filling smaller frieze areas. Another good option is to run them above or below picture rails in bedrooms, or any room where wood is the only treatment on the walls. Large Stencils ~ Larger rooms, especially ones with high ceilings, are perfect environments for bigger designs. Portieres, either in conjunction with - or as stand alone applications - are also beautiful ways to bring these designs to life. If one of these designs is desired and you have a small room in mind, consider stenciling one dominant wall or applying more muted and softer colors.